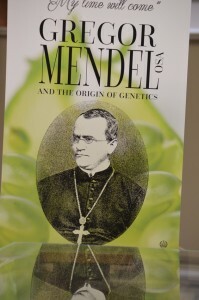 “Gregor Mendel, OSA, and the Origin of Genetics,” an exhibit on Falvey’s first floor, introduces Mendel; commemorates the 150th anniversary of Mendel’s paper, “Experiments in Plant Hybridization” (Versuche űber Pflanzenhybriden); looks at Mendel on campus; and offers a small display related to the Mendel Medal. The name Mendel is familiar to the Villanova community as the name of a campus building, the Mendel Science Center, usually called Mendel Hall. But how many are aware of the man for whom the building is named? Gregor Mendel (1822-1884) is the acknowledged father of genetics based upon a paper he presented in 1865 and published the following year. He was born in the German-speaking Austrian Empire (now the Czech Republic) to a farming family. At age twenty one he joined the Augustinian Abbey of St. Thomas in Brűnn to further his education. The abbot, who was interested in heredity of plants and animals, encouraged Mendel to experiment with plant genetics in the abbey’s five-acre garden. As noted he presented his research, but it was virtually ignored until 1900. Falvey’s exhibit begins in the vertical case with an introduction to the exhibit and Mendel’s experimentation with plant hybridization using peas. A large eye-catching banner (from University Archives) with a life-like portrait of Gregor Mendel, OSA, commemorates the 80th anniversary of the Mendel Medal. Also in this case are a few books about Mendel and a small framed portrait. Five more themed cases continue the exhibit, beginning with “Early Life” and ending with “The Mendel Medal.” Illustrating Mendel’s “Early Life” are a children’s book from Special Collections, Gregor Mendel: The Friar Who Grew Peas by Cheryl Bardol; Life of Mendel by Hugo Iltis (Augustinian Historical Institute); views of Brno (location of the Abbey of St. Thomas where Mendel lived and worked); views of the Mendel Museum and the foundations of his greenhouse at the Abbey; and select pages from a manuscript photograph album, The Mendel Tradition in Brno, Czechoslovakia by Herbert Christian Hanson. The next case, “Versuche űber Pflanzenhybriden (Experiments on Plant Hybridization),” shows a facsimile reprint of Mendel’s paper as it appeared in print in 1866, a program from the presentation of a copy of “Verhandlungen des naturforschenden Vereines in Brűnn” by the Augustinians of the Province of St. Thomas of Villanova to the University and other related publications. To celebrate the 150th anniversary of Mendel’s paper, “Experiments in Plant Hybridization,” the University will hold a symposium on Monday, Dec. 7. 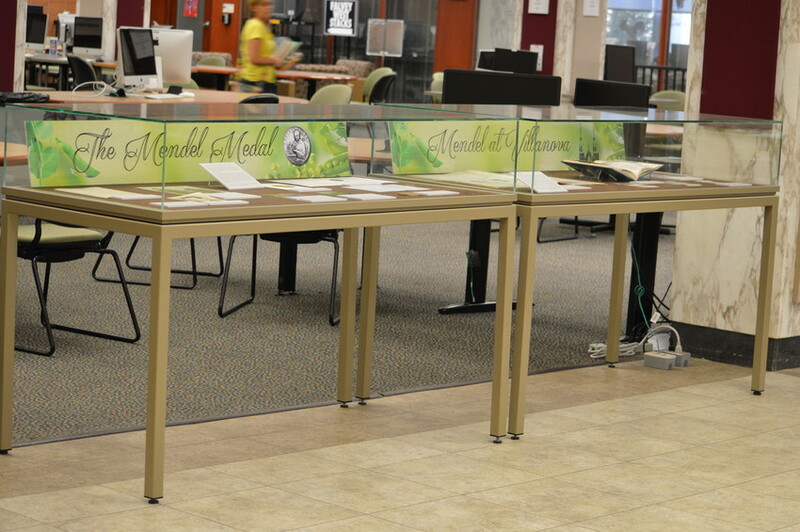 “After the Pea Paper” case displays assorted publications from the Augustinian Historical Institute and Special Collections, including Mendel’s Dwarf (1998), fiction by Simon Mawer. A placard tells the viewer that Mendel’s paper was almost unknown until the early 1900s. 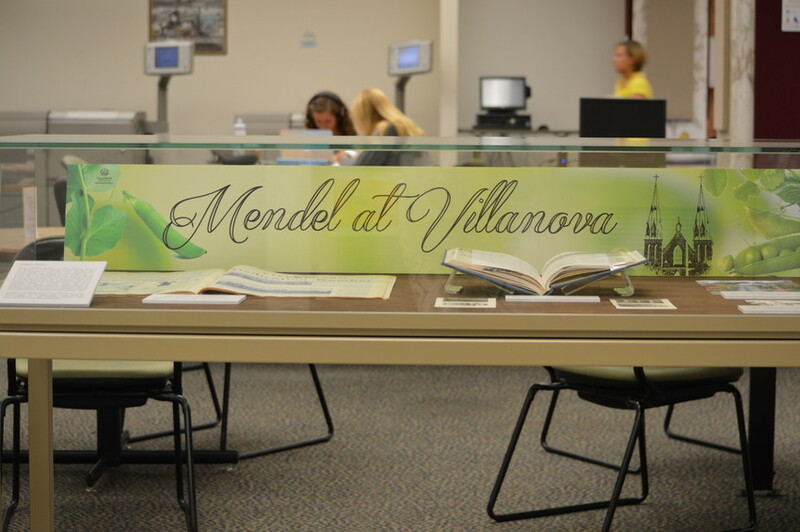 “Mendel at Villanova” displays copies of the Villanovan with articles about the dedication of the first Mendel Hall in 1929 and the current Mendel Science Center in 1961. This display features photographs of the 1910 statue of Mendel in Brno and of the one on campus beside the Mendel Science Center. “The Mendel Medal: Honoring Pioneers in the Sciences” case presents photographs of some of the recipients, programs from the award ceremonies, a 1929 Villanovan article about the presentation of the first Mendel Medal to John A. Kolmer, MD, and an obverse image of the medal as designed and sculpted by John R. Sinnock. The Mendel Medal, named in honor of Gregor Mendel (1822-1884), OSA, “the father of modern genetics,” is now awarded annually to an outstanding scientist. The award was established in 1928 and given each year until 1943. From 1946 until 1968, the Mendel Medal was awarded only eight times and from 1968 until 1992 there were no awards. In 1992 the Mendel Medal award was reestablished and has been given each year to an outstanding scientist. This year’s Mendel Medal recipient is the Nobel Prize-winning biochemist, Brian Kobilka, MD, of Stanford University School of Medicine. Dr. Kobilka will give the 2015 Mendel Medal Lecture at 2:00 p.m., October 2, in the Villanova Room, Connelly Center. 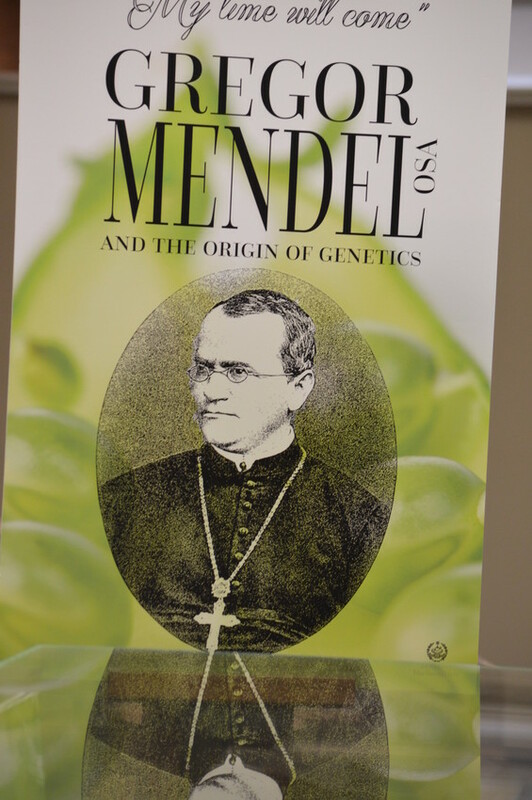 This very educational exhibit about Gregor Mendel, OSA, his important scientific discovery and his relationship with Villanova is well worth visiting several times; there is far more here than can be readily absorbed in just one visit. 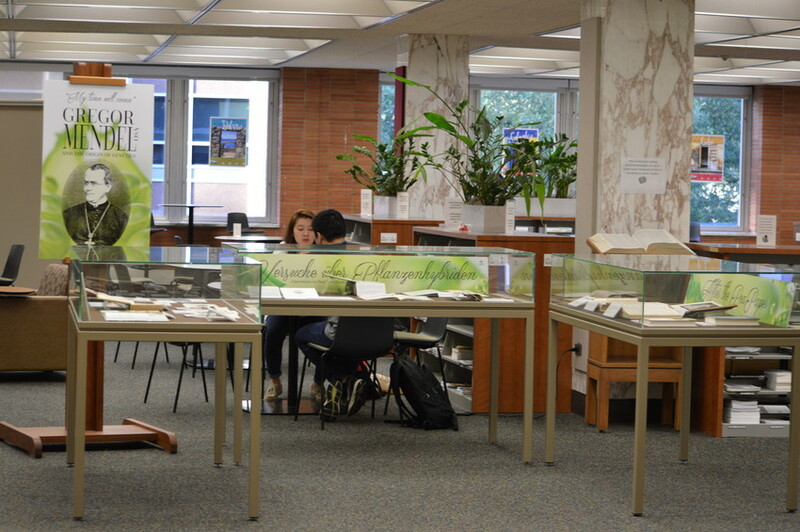 This exhibit is a collaborative effort, drawing from materials owned by University Archives, Falvey’s Special Collections and the Augustinian Historical Institute. It was planned and materials were curated by Special Collections and Digital Library Coordinator, Michael Foight and Digital & Special Collections Curatorial Assistant Laura Bang. Graphics were designed by Joanne Quinn, Falvey’s graphic designer. The exhibit will be open throughout this semester.